The Transit of Venus is a rare astronomical phenomenon in which the planet Venus passes across the face of the Sun. First observed by two English astronomers in 1639, it occurred only four more times before the current pair in 2004 and 2012. Despite its rarity it has a dramatic place in the history of astronomy. It was brought to prominence by Edmond Halley who saw how it could be used to calculate the distance between the earth and the sun, and thus establish the absolute dimensions of the whole solar system. During a transit, the small black dot of Venus crosses the sun’s disc. The exact timing and length of its path depends on the position of an observer on earth. For two widely spaced observers, the differences are large enough to be measured. With the separation of the observers taken as a base line, the distance to the sun itself can be calculated. 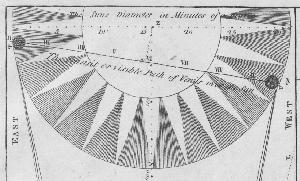 Halley published his method in 1716, knowing that he would never see a transit of Venus himself. Expeditions were sent out across the globe for the transits of 1761 and 1769. Although hundreds of observations were reported there were difficulties achieving the precision Halley had hoped for. 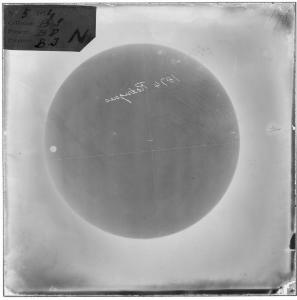 The pair of 19th-century transits in 1874 and 1882 gave an opportunity to use new technologies, such as photography and telegraphy. Expeditions were sent out from many countries including the United States, Great Britain, France, Germany, Russia, Italy, the Netherlands, Belgium, Denmark, Brazil and Mexico. Despite government funding and international discussion the results were considered by many to be disappointing. Alternative means are now used to measure the astronomical unit (earth-sun distance): radar provides a level of precision and accuracy undreamt of by earlier investigators. The attraction of the transits in 2004 and 2012 lies primarily in their rarity and historical significance.